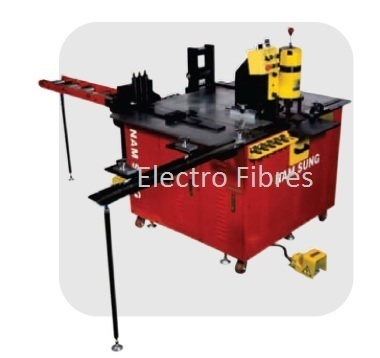 Owing to our vast manufacturing facilities, we are able to offer high quality Namsung Busbar Cutting Bending and Punching Machines. The range offered by us is manufactured using high quality components and spare parts so that it is in tandem with international quality standards. To meet the variegated requirements of our esteemed clients, we offer these products in various specifications. Inaugurated in 2006, we, Electro Fibers, have established ourselves as one of the prominent manufacturers, suppliers, exporters and traders of various types of Electronics Products. Our product range includes Hexagonal Insulators, Cylindrical Insulators and Standard Insulators. Our products have earned accolades for their high quality and longer working life. We are ever committed to provide very innovative products that not just fulfill but also surpass the expectations of the customers. We have a state-of-the-art manufacturing unit that covers a vast area and is equipped with latest machines & tools. The infrastructure of the company is segregated into different sections such as manufacturing unit, quality testing unit, R&D and warehousing & packaging unit. Providing optimum quality products is the paramount goal of our company, thereby, we choose first grade raw materials from industry certified vendors after conducting an extensive research on them. Along with this, safety features and the quality of our products are regularly checked by our highly qualified quality control professionals before they are delivered to our customers. Our prime focus is to deliver products at our clients’ premises without any delays. We exports in UAE, Sri Lanka and South Africa.